Caribbean GeoTextiles' environmentally friendly GeoTextile tubes have been used in the Caribbean regions for structures lik Hurricane Storm Protectione groins, breakwaters, sand dune cores; containments for dredge disposal, shoreline protection, wildlife habitats and wetland construction. Environmental irrigation and flood control, river bank Sediment soil stabilization, soil conservation, Shoreline coastal beaches erosion control, When used for shoreline protection, structures can be employed to protect highways, utility corridors, airports and also public or government buildings. 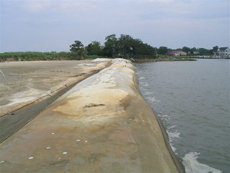 GeoTextile structures can provide protection against major storm activity. Structures utilized in this effort are usually breakwaters, seawalls, revetments, groins and jetties. We service the Bahamas and Exumas and Caribbean region and can help you find a cost effective solution to your project. Contact SDMI dba Caribbean GeoTextiles at 770-658-2903 to find out how we can help. Our GeoTextile Tubes or Bags are used in Hurricane Storm Protection infrastructure applications and are environmentally friendly, aesthetically pleasing and cost effective. Our woven geotextile fabric construction conforms to the highest quality in the industry for use in Caribbean including the Bahamas, Trinidad & Tobago, Puerto Rico, Cayman Islands, Dominican Republic, Virgin Islands, Haiti, Exumas, St. Lucia, St. Kitts, Cayman Islands, Jamaica, Aruba and Antigua as well as Central America such as Belize, Guyana, Nicaragua, Suriname, Costa Rica, Guatemala, Grenada, Guadeloupe and Honduras.